E-Cigarettes might produce vapor and not smoke, but that doesn’t mean E-Cig users can get away with anything they want when vaping. 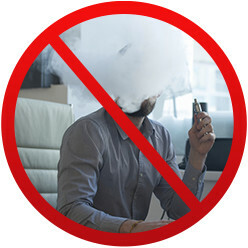 To reinforce general rules users should follow before vaping, we’ve provided the eight following etiquette tips to help remind E-Cig smokers they still need to keep their surroundings in mind, before puffing away. 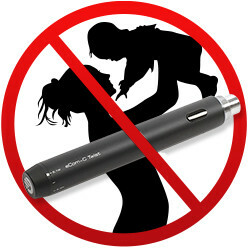 You wouldn’t smoke tobacco cigarettes around your children, right? Well, you shouldn’t use E-cigs near them either, because many E-Cigs have nicotine and nicotine is addictive. We understand you’ve worked hard to wean yourself off tobacco cigarettes. 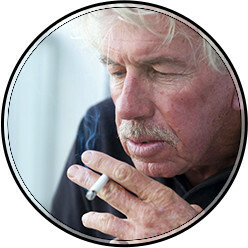 But, that doesn’t mean you need to act pretentious towards normal cigarette smokers. Instead, treat them as equals and help them understand why you made the move and how they can too. 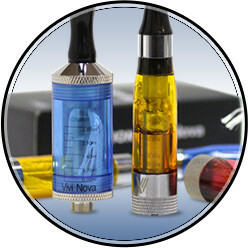 We understand that vapor is technically not smoke and therefore, ‘no smoking’ rules don’t technically apply to E-Cigarettes. However, anyone with common sense should know it’s still not acceptable to vape in public places, like restaurants, movie theatres, work, public transportation and hospitals. If you see others doing it and insist, at least ask an employee first. If you vape often, you undoubtedly wind up with lots of empty refill cartridges and eLiquid bottles. For the sake of your spouse, kids, or even your pet, don’t leave them lying around the house. That’s not only a messy habit, it’s potentially dangerous if they’re swallowed. Just because no one can see you in the bathroom stall, doesn’t mean you’re allowed to vape behind closed doors. 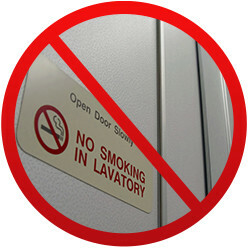 Never subject bystanders to secondhand vapor, especially in small public areas like bathrooms. This one should be obvious, but we’re sure many users still manage to subject their family to vapor, in the middle of dinner. No one asked for that. Nor do they want to breathe your secondhand vapor, especially when eating food. 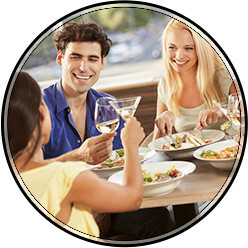 Where are your table manners? Cloud chasing is when vapers attempt to exhale the biggest vapor clouds possible. 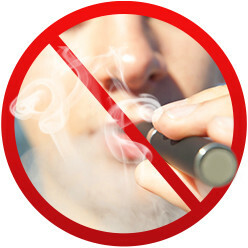 While this is a fun activity in E-Cig stores and competitions, purposely blowing huge amounts of vapor into the air in public is quite impolite and should be avoided at all costs.